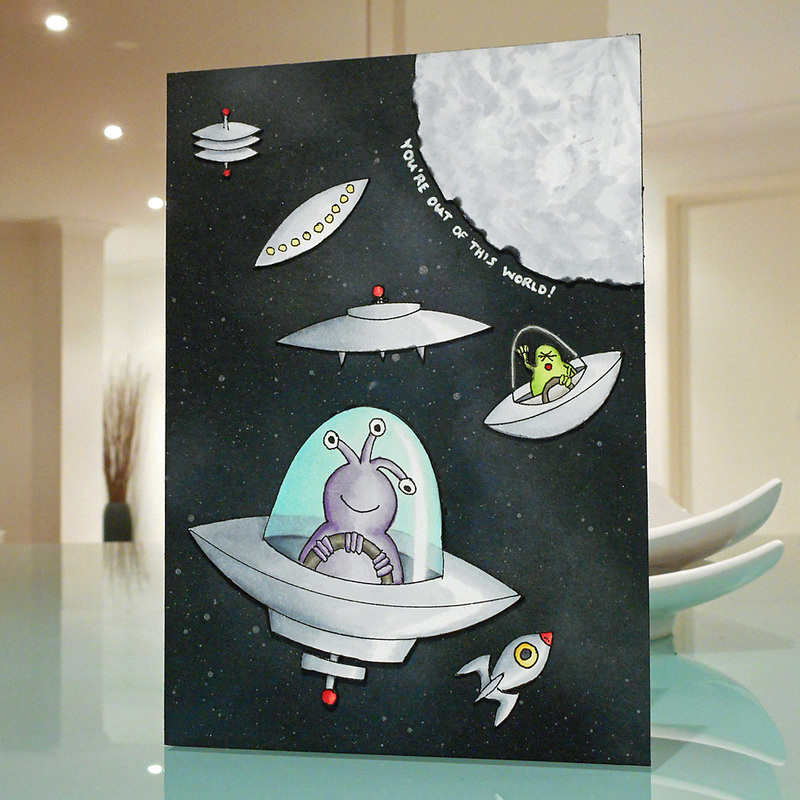 So of course I had to make a flying saucer card, even though it meant drawing everything myself. I sketched the image size and placement on scrap paper (extremely messily), then used oval and circle dies, coins, cutters, and even a side plate to help with the curves as I drew my line image “master”. This is my first venture into Copic colouring too. I’d used Copic products before but not in the normal manner — the “Various Ink” refills work nicely with polymer clay in the same way more traditional alcohol inks do — so I bought a variety of Copic markers and had a go. Fun stuff! I had a bit of trouble with ink dripping from one marker and ink spattering from all of them when clicked back into their lids, but the colouring itself was lovely even though I only had a vague idea of what I was doing. I can see why they’re so popular! I was undecided whether to colour and cut out the “glass” over the bug-eyed monster (because I love the pale blue-green colour) or to handle it as though it was transparent, and in the end I tried both. When doing this I was amazed afresh at the ease with which so many of you do “fussy cutting”, because I was absolutely dreadful at it! In the end I switched to a scalpel which was less bad, but I think I need a lot of practice. I like the borderless look but it nearly drove me insane. I tried the transparent version first, and while the geek in me knows it is more “correct” (so to speak) I liked the coloured version better and ended up going with that. Let’s just pretend there’s some weird gas in there that makes it look like that! Here they are side by side… which do you prefer? The background was done with Distress Ink: Shaded Lilac and Iced Spruce for hints of background colour, then plenty of Chipped Sapphire and Black Soot over the top. I mixed a bit of pearl mica powder with water and flicked it on from fairly high for some subtle stars, then sealed it with workable fixative once dry. Oh, these are amazing! Fabulous take on the sketch! Such a fun card! 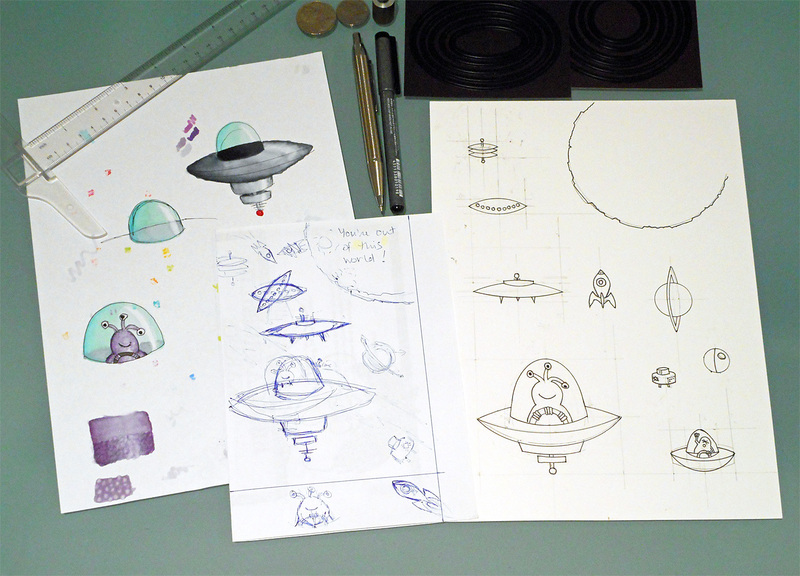 I would never have thought of flying saucers but it fits the sketch perfectly! Wow, what an amazing work! I love your drawings and your coloring. The whole card/s is/are absolute fantastic. I had a lot of fun with these cards and am really pleased that Narelle, who commented earlier, nudged me into making some. 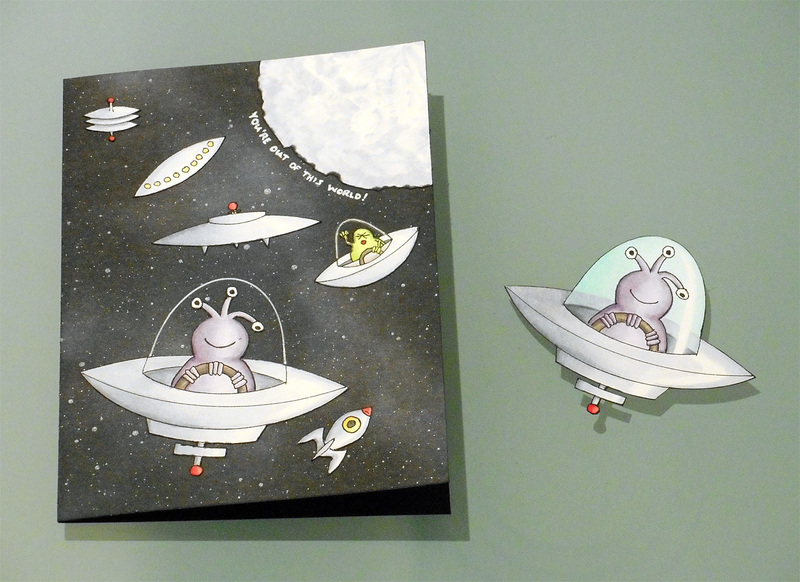 I’m pretty sure I’m going to try to work the bug-eyed alien into some future cards too!